Jahangir expressed hope that the situation would improve through diplomatic action, but this does not seem likely. Iran regime’s President Hassan Rouhani made various promises during his campaign, which echoed promises that he made and did not follow through on after taking office in 2013. This so-called moderate has seen over 3,000 people executed during his four-year term and continues to see the Iranian people suppressed at the hands of the Regime. The only way to achieve human rights in Iran is through regime change by and for the people of Iran. While hundreds of international figures and lawyers have called for a trial of the regime’s leaders and the perpetrators of the massacre of members and sympathizers of PMOI/MEK in 1988, the Iran regime is trying to destroy the graves of MEK martyrs killed in this crime. According to the reports from various parts of Iran, the regime has been eliminating the signs of this MEK genocide in several cities including Ahvaz (southwestern Iran), Mashhad (northeast), Isfahan (center of Iran), Tabriz and Ardabil (northwestern), etc. They seek to destroy the mass graves of MEK members so that the families could not pay tribute to their loved ones the way they have been doing for years in various ways such as cementing the graves or removing the garbage and so on. The Iranian regime also destroyed the mass graves of MEK martyrs in Vadi-e Rahmat Cemetery of Tabriz under the pretext of carrying out construction projects. Moreover, the supporters of the MEK distributed the pictures and videos of grave destruction on the internet on June 23 2018. The news of such crime has been also posted in forms of pictures on Vadi-e Rahmat Cemetery Telegram Channel on September 11, 2017. As the Iran regime admitted, the construction project includes a total area of 4500 square meters. The procedures consist of excavating operations, rolling, leveling and fitting, pouring concrete, building walls, gridding, installing light pylons. Three companies and the Supervision of Tabriz Civil Engineering Department launched this project and the Cemetery Organization of Tabriz Municipality is the employer. He added,” The cemetery of MEK martyrs is exactly located behind these tall trees, as the supporters of the MEK released pictures of this area. They are currently destroying the cemetery.” While a Justice Seeking movement is formed to try the perpetrators of the 1988 massacre of MEK and non MEK affiliates, the Iranian regime intends to eliminate the signs of such brutal crime. 1. The full name of MEK and non MEK affiliates who were executed. 2. How many MEK and non MEK affiliates were killed in each city and province? 3. The mothers of those executed shall know where their loved ones are buried and where the address of mass graves is. 4. At the end, if these criminals are proud of such crime against the humanity, then why do not they reveal the names of the members of death committees in different provinces? During the past few days the mullahs’ regime in the city of Tabriz, northwest Iran, has begun a campaign of vandalizing graves of members of the People’s Mojahedin Organization of Iran (PMOI/MEK) executed back in the 1980s, especially those massacred during the summer of 1988. These now destroyed graves were in the Rahmat Valley Cemetery. To this point the graves of 75 MEK martyrs, including Akbar Choopani and Soraya Abolfat’hi, who was executed while pregnant, have been vandalized. Iranian intelligence has supervised measures placing 10 centimeters of cement and leveling the grounds in the cemetery to destroy all evidence of such a martyrs’ cemetery. They have also placed a sign reading, “Leveling the children’s block” and installed a number of gravestones in the area where the cement has been poured, to prevent any sign of the gravesite destruction. Attached images provide signs of the machinery used, the vandalized gravestone, and various phases of cement pouring and the placing of new gravestones. Last month in Mashhad, northeast Iran, mass graves of PMOI/MEK martyrs in the Beheshte Reza cemetery were also vandalized. In the city of Ahvaz, southwest Iran, city authorities have been widening a road near a cemetery in order to vandalize martyrs’ graves. Signs of tumbled bodies in a mass grave previously covered with cement were seen as the digging began in the area of phase 2 of Padadshahr and the Bankdar Boulevard in this city. Authorities quickly covered the mass grave with dirt and continued to widen the road. The Iranian Resistance calls on all international human rights organizations, especially the United Nations High Commissioner for Human Rights and the Special Rapporteur of the Human Rights Situation in Iran to condemn this inhumane act and take urgent action to prevent the destruction of such evidence of previous mass executions and massacre of political prisoners mainly MEK members, especially those of 1988. Iran’s ruling dictators must face justice for their crimes against humanity and 120,000 political executions. According to the data collected from material published by the Iranian state-run press, human rights activists and their websites, or from private sources in touch with the Iranian Resistance, 80 of those executed during Rouhani’s tenure have been women. Nevertheless, the actual figures are definitely higher, as most executions in Iran are carried out secretly without anyone knowing except those who carry it out. 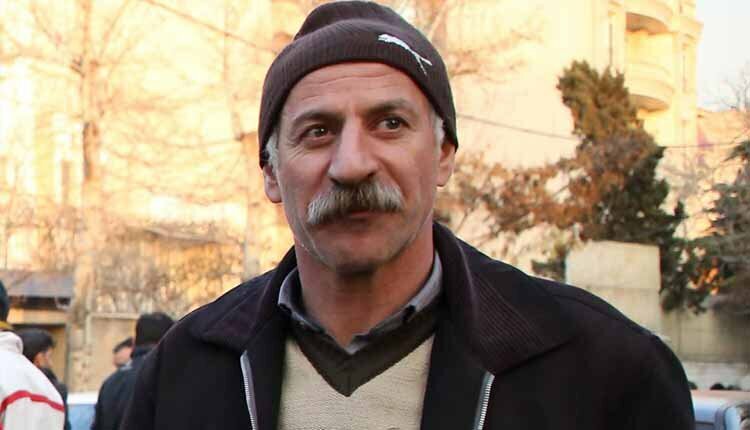 71 Moluk Nouri Sep. 29, 2016 Central Prison — Orumieh . 73 unnamed woman January 15, 2017 Central Prison — Karaj . That’s a lot of women. Hardly any names and no crimes. Like they don’t exist. That’s right, this is huge crime by a brutal anti women regime. I can only imagine what women there must be feeling. In the past few days, 28 executions have been carried out in Iranian prisons all over the country. According to Iran Human Rights organization, four prisoners were hanged on 8 July in Orumieh prison including Khalil Musavi Kousi, Kheiroddin Mashmoul, Mirhaj Abdi and Sofi Kolonakzadeh who were all convicted of drug related crimes. Furthermore, two prisoners each were hanged in Maragheh prison, Rajai Shahr prison, Gorgan Prison and Semnan Central prison in the past one week. Fellow compatriots, 29 years ago on these days, Khomeini, the century’s most ruthless murderer, launched the massacre of 30,000 political prisoners affiliated with the PMOI and other dissident groups. He sought to uproot the resistance movement in a bid to preserve his own rule. He wanted to do something that no one would ever again think of change and of freedom. He found his answer in the hasty annihilation of the PMOI and all those who persisted on the ideal of freedom. In the face of such unprecedented brutality, the PMOI prisoners took pride in going to the gallows in the thousands. They registered themselves in the historical conscience of their nation as symbols of dedication and loyalty to the cause of freedom. And the history of Iran was blessed with the light and hope of their unwavering resistance. Throughout the years, their blood has continued to run in the veins of society, provoking the spirit of rebellion and protest in the struggle against the tyrannical clerical regime. Our endless salutes to all the prisoners massacred in 1988 who persisted on their positions against the Velayat-e Faqih under interrogation and stood up for freedom. Their struggle and resistance has been battering the regime since then until now. Khomeini concealed their names, but they are the most famous men and women of Iran’s modern history. The regime hid their graves, but they have remained the most spirited and obvious members of the nation fighting in the field. Long years pass since they kissed the gallows, but they continue to sing the crimson anthem of freedom. Last year, on July 28, 2016, the families of martyrs and political prisoners issued a statement announcing a campaign commemorating the victims of the 1988 massacre. The movement demanding justice for the victims of the massacre is now one-year-old. During this period, the campaign energized by the victims’ sacrifice and our nation’s will to achieve freedom has time and again shaken up the clerical regime that relies on massacre. It has brought about broad-based knowledge in Iranian society particularly among the youth about the dreadful crimes committed by the Velayat-e Faqih regime. It shattered the mullahs’ conspiracy of silence to cover up the 1988 massacre and compelled the ruling clerics to confess to their involvement in this crime against humanity. The justice seeking movement dealt a heavy setback to Khamenei who had nominated a death-commission member for presidency. It defeated the regime in its totality in the elections sham, as the nation embraced the movement’s slogan of “no to the executioner, no to the charlatan.” The campaign also resuscitated this case internationally while it had been silenced by the western governments’ policy of appeasement. These efforts led to the point where the UN Secretary General noted the 1988 massacre in his annual report this year. This year-long campaign proved that the Velayat-e Faqih regime is extremely vulnerable with regards to the slaughter on which the pillars of its rule rest. As a result, every effort by the mullahs to incriminate the PMOI immerses them even further in a quagmire of disgrace. In the past year, too, supporters of the Iranian Resistance risked their own lives to collect the previously unannounced names of victims of the massacre and addresses of their graves, as well as information about members of the death commissions in the provinces. I thank all of them and everyone who joined the justice seeking movement over the past year. I thank all the youths and students who voiced their demand for justice for victims of the 1988 massacre at any opportunity, and the prisoners who supported the movement under the most difficult circumstances. Nevertheless, everything done so far has been only the first step. The Iranian people and Resistance will not relent until those in charge of the massacre of political prisoners, namely those who hold the highest positions of authority in this regime, face justice. 1. I call on all the courageous youths of this land to stage protests to compel the regime’s leaders to publish a complete list of names of those massacred, addresses of their graves, and names of those in charge of the slaughter. 2. I call on the families of martyrs and political prisoners to gather at the gravesites of their martyrs and in this way force the clerical regime to recognize their trampled right to hold memorial ceremonies for their heroic children. 3. I call on my fellow compatriots to actively participate in the national campaign to collect the information of the martyrs, find their tombs and expose the mullahs and murderers involved in this crime. 4. I call on young seminary students and the clergy who have distanced themselves from the ominous regime of the velayat-e faqih to openly condemn the massacre and distance themselves from Khomeini and the inhuman and anti-Islamic velayat-e faqih regime. 5. I call on parliaments, political parties, human rights organizations, religious leaders, political and social personalities in various countries to strongly condemn the massacre of political prisoners in Iran in an act of solidarity with the Iranian people. 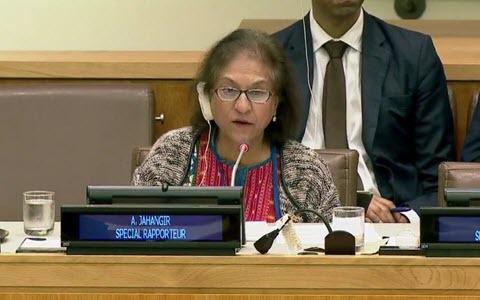 They should urge their governments to make their continued political and commercial relations with the mullahs’ religious dictatorship contingent on end to executions and torture in Iran. 6. I urge the UN High Commissioner on human rights to immediately set up an independent committee to investigate the 1988 massacre and subsequently put those in charge before justice. I urge the UN Security Council to make the arrangements for prosecution of the regime’s leaders for committing crime against humanity. 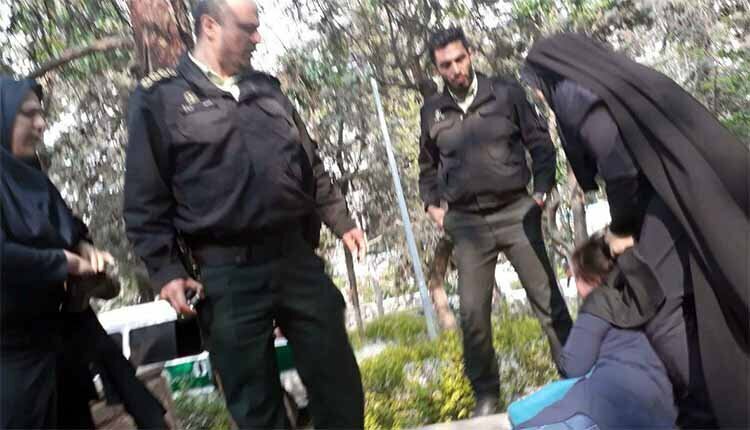 All the major cases of carnage and repression in the past quarter of a century in Iran are linked to the person of Khamenei and his corrupt offices. He earned succession to Khomeini by actively participating in the 1988 massacre, and must be prosecuted for crimes against humanity before all the other leaders of the regime. Dear compatriots, the main target of the massacre in 1988 was the PMOI. Khomeini taught his successors that to preserve power, they must annihilate the group that persists on its positions. In the past three decades, Khamenei and his accomplice, have put this lesson into practice. In contrast, the PMOI and the National Council of Resistance of Iran, as the democratic alternative to the regime, are the force of victory and freedom. They will realize their glorious goal by relying on the people of Iran. On that day, the victims of the 1988 massacre and all the 120,000 martyrs fallen for Iran’s freedom will live in the determination of Iran’s youths, in 1000 bastions of rebellion, 1000 Ashrafs, and in the army of freedom. They will thus start a blessed era of freedom, democracy and equality. Endless salutes to the shining stars of the Iranian Resistance, the proud martyrs of 1988. And hail to the pioneers who have risen to call for justice for the victims and continue their path and cause on a higher level for Iran’s freedom.